Hydrogen rich water also called Water for Life, because it is good for our health. We can drink it for slow down aging, and we also can wash hands and face with it to keep our skin in good condition. 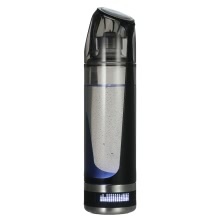 This portable Hydrogen Rich Water Bottle provides healthy water for you and enable you to live a healthier life. 500ml large capacity water bottle. Professional in producing a hydrogen rich water. Made of food grade plastic, safe to use and sturdy that you don&apos;t have to worry about it breaking. Can powered by power adapter, computer or mobile power pack, which is very convenient both at home or need to take it on the go.